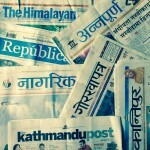 The Kathmandu Post report headlined “Parties in plains trying to win over constituencies” by Roshan Sedhai datelined Kathmandu has quoted six unnamed sources: leaders, observers, analysts, leaders of Terai Madhesh Loktantrik Party (TMLP), an aide to TMLP Chairman Mahanta Thakur and a leader from [Federal Socialist] Forum Nepal. The Kathmandu Post report headlined “Goon killed in ‘encounter'” by Manish Gautam datelined Kathmandu has quoted four unnamed sources: Doctors at TU Teaching Hospital, locals, police source and an eyewitness. The Kathmandu Post report headlined “GPS way to monitor quake risks'” by Pragati Shahi datelined Kathmandu has quoted one unnamed source: geoscientists. Nagarik report headlined “Demarcation dispute pushes parties further apart” by Balaram Pandey datelined Kathmandu has quoted four unnamed sources: a leader present in the meeting, source, a leader from CPN-UML and a leader from Nepali Congress. Nagarik report headlined “Encounter-killing of Ghainte in broad daylight” by KP Dhungana datelined Kathmandu has quoted five unnamed sources: a doctor, first eyewitness, second eyewitness, third eyewitness, a police officer. Nagarik report on medical education headlined “Admission seats increased ignoring recommendation” by Deepak Dahal datelined Kathmandu has quoted one unnamed source: a high placed source of the ministry [of education]. The Himalayan Times report headlined “ADB allows blacklisted Chinese firm to continue with project to expand GBA” by Rajan Pokharel datelined Kathmandu has quoted three unnamed source: a senior official at the Ministry of Culture, Tourism and Civil Aviation, a senior CANN executive, and aviation officials. Annapurna Post report headlined “Ghainte killed” by Subash Gotame and Shambu Kattel datelined Kathmandu has quoted one unnamed source: a source. Annapurna Post report headlined “Meeting disrupted due to prime minister’s absence” by Narendra Saud and Rewati Sakpota datelined Kathmandu has quoted one unnamed source: a leader. Kantipur report headlined “Parties resort to trading charges” by Sarojraj Adhikari datelined Kathmandu has quoted two unnamed sources: a leader from CPN-UML and a source.